(CNN) - Republican presidential candidate Michele Bachmann responded Wednesday to a report by NBC that the mental health clinic run by her husband has collected annual Medicaid payments totaling over $137,000, while she has criticized the program for swelling the "welfare rolls." "Medicaid is a valuable form of insurance for many Americans and it would be discriminatory not to accept Medicaid as a form of payment," Bachmann spokeswoman Alice Stewart told CNN. "As a state-sponsored counseling service, Bachmann and Associates has a responsibility to provide Medicaid and medical assistance, regardless of a patients financial situation." 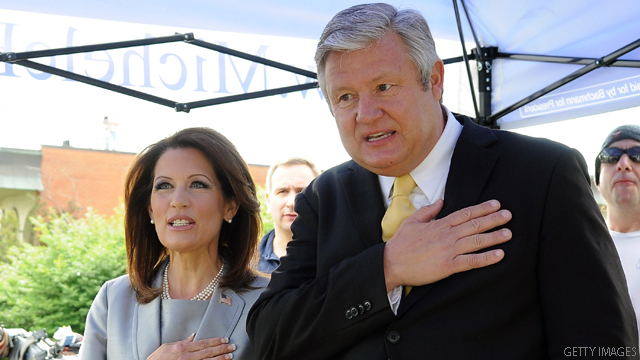 "The previously unreported payments are on top of the $24,000 in federal and state funds that Bachmann & Associates, the clinic founded by Marcus Bachmann, a clinical therapist, received in recent years under a state grant to train its employees, state records show. The figures were provided to NBC News in response to a Freedom of Information request. The clinic, based in Lake Elmo, Minn., describes itself on its website as offering "quality Christian counseling" for a large number of mental health problems ranging from "anger management" to addictions and eating disorders." They billed Medicaid for "counseling" people to pray away their legitimate problems/issues. This is first class hokum and fraud. I guess federal monies are ok as long as SHE is benefiting from them. Does the word HYPOCRITE come to mind? Plus the husband got his "doctorate" through an online college and has no license. So.............Let me see, Michele, sounds to me a little socialism is OK. Hypocarcy at its best! why didn't this story make the air? It is relevant to what she has been saying in her "sound bite" conversations w/you folks. Wow, I like thinking that our HC taxes are being used to provide emergency and life saving care for children and those who can't afford to provide for themselves in such a crisis.. Sounds like instead that money goes to profiting 'Christian' clinics that 'counsel' patients on behavioral 'illnesses'.. What a farce. We don't accept government money except when we do and that pesky media finds out about it. how much did they get for being foster parents? was this for real or just another way to "game" the system? Yeah it is valuable. Why do you want to stop it? typical gop hypocrisy. "big gov'ment" is not good, except when it's good for you. hope their ja-sus is waiting for them at the pearly gates with a blunt instrument. 8 Years of "Trickle Down" economics has only left a dribbling wet spot on working Americans's shoes! "As a state-sponsored counseling service"
Surely CNN this is a mistake! Little Miss "Smaller Government" has a husband that owns a "state-sponsored" clinic? "quality Christian counseling" ...meaning that unless you submit to their religious beliefs you are out. Well what do you have to say you twit? Does this little venture mean you are not going to criticize this while lambasting other uses of $?? And don't forget that farm subsidy money and the dole for 23 foster kids.They've fed well from the public trough. Michelle has gotten caught in a list of lies about Medicaid and government subsidies her family has taken and used for years. Michelle is a fraud and hypocrite just like the rest of the Republican Party. The only thing she is a role model for is why we need to strengthen our education system so we do not have people who know nothing about history, english or government. Bachmann has a lot of government payments that are to family or relatives, that need to be talked about. I don't think these deals pass the smell test, and should be brought up. I would like to see what she and her family, and relatives, pay their workers, charge their customers, and how much they reap in in profits. Let me see if I've got it straight,, if it's payed to your husband a valued insurance,, if it's payed to anyone else it's socialism! maybe you misspoke again? A typical, hypocritcal GOP response. The GOP party of gred is totally against "big government" and wasted government spending UNLESS they are directly benefiting from it! No wonder we have so much greed in the country when we have leaders taking advantage of the system. So how does a non-medical operation qualify for Medicaid payments? Faith-based? Sounds more like a witch-doctor operation! What do they do? Tell you that you can just pray away your problems? Sounds to me like this operation is PREYing away THEIR problems! OK, so give the Medicaid and grant money back.... No? There you have it folks, not ok for you to get medicaid but ok for them to profit off it. I smell more and more hypocrisy with this candidate as each day passes on…. Medicaid is still Federal money which means Bachmann hates Government entitlement programs but she likes the money. Just keep following the money trail all the way to the family farm. Why is it that this idiot and all many other idiots who happen to be GOPers (Palin, Santanorum, Barbor, Coulter, etc., etc.) can blurt lies shrouded in feable nonsense and jibberish then they and their followers blame the media for all the stupid crap that comes out of their mouth?? It is the GOP culture of poor me, I'm always the vicitim. GOP is nothing more than a herd of gutless cry baby wimps! I thought Benny Hill had passed on, ese! talk about animal farm. unbelieveable. It's illegal and complicit so long as it doesn't affect your bottom line, right? And the GOP is wondering why they are having such a hard time connecting to the people.